Update: As usual, I love my commenters. It's a navigational aid for pilots! Read the comments for info. Cool. It almost looked like artwork, but it appears to be functional. I remember the outside part looking hexagonal, but here it looks like a square with the corners truncated. That part was transparent and probably plastic or glass. It had a pattern etched into it, almost like a solar panel pattern (when the Sun caught it it glittered like water). It was pretty big, maybe 20 meters across. On top of that panel was a circle made up of many dozen smaller bluish spheres or domes. In the image the ring looks solid, and that may be due to the lower resolution. 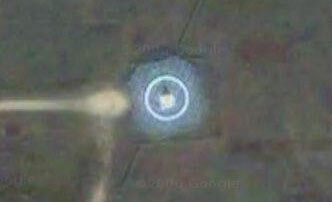 Inside that circle was a tall, skinny pyramid, like the Transamerica building in San Francisco. It looks like a square in the picture, but check out the shadow pointing north: it's triangular. The whole schmear sits at the eastern end of a dirt roadway which connects to a main road. I didn't realize how big it was until we passed the road a few seconds later and I saw how big cars and trucks looked. I wish I had had my camera handy! I did some searching but came up empty; I asked a few people while I was there but no one knew anything about it! So: anyone have any clue what this thing is? Art? A SETI broadcast antenna? A sooper sekrit gummint eavesdropping device? Maybe I should ask Natasha Henstridge.